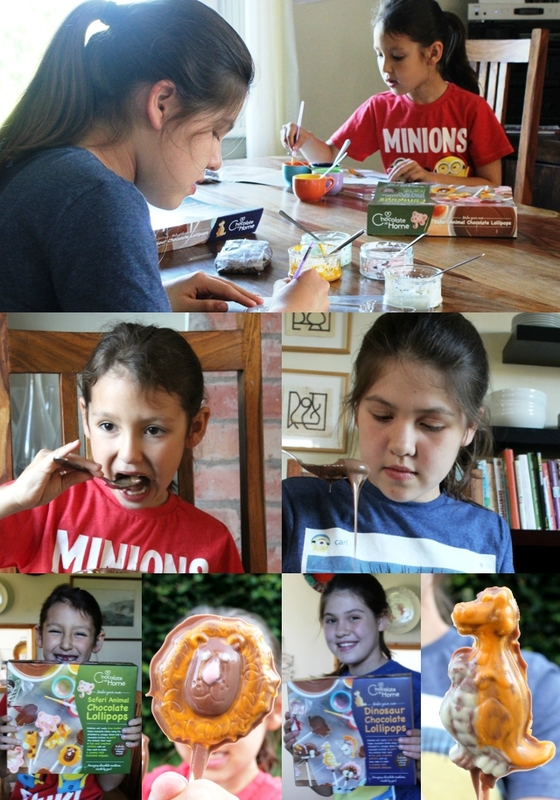 When I gave this post the title ‘chocolate animals’ I was thinking of the lollipops we tested out at the weekend, but the description could equally apply to my two girls, who go wild, literally, for chocolate in all forms! We’re already fans here of the Chocolate at Home chocolate making kits. We’ve made their posh grown-up truffles and their easy-to-make bumble bee lollipops for kids. 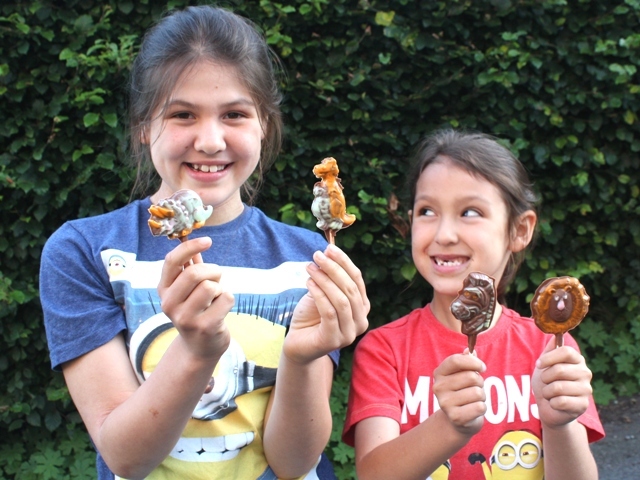 Their newest chocolate lollipop kits to join the range, Safari Animals and Dinosaurs, were another big hit with Jess and Mia, who said they liked them even more than the bumble bees. But then Jess does have a thing for dinosaurs and Mia adores her jungle animals, so these kits could have been designed with them in mind. The kits are very simple to use and the instructions are clear and easy to follow. My daughters are seven and ten, and I could pretty much leave them to it. Younger children would definitely need a helping hand, particularly when it comes to melting chocolate. Each kit comes with enough good quality milk chocolate to make four lollipops, strawberry, orange, lemon and white chocolate buttons so you can paint your creatures any way you like, as well as the lollipop moulds, a food-safe paint brush, lollipop sticks, bags and ties. At £13.95 they’re not cheap, but you can use the moulds again and again and Chocolate at Home do refill packs containing enough chocolate, sticks, bags and ties to make another batch for £2.99. We had a really fun afternoon making these, and I think any kid would be thrilled to receive one of these kits as a present – creating your own colourful chocolate creatures and getting to gobble them up afterwards, what could be more fun? See the full range and buy online at chocolateathome.co.uk. Disclosure: I was sent complimentary kits by Chocolate at Home for review purposes. Only products we genuinely like make it onto the blog – I receive plenty more that never make an appearance. No money exchanged hands and all opinions expressed are my own.